Grumpy Cat will forever be remembered as one of the most famous memes of all time. The frowny feline exploded in popularity in 2012 and has been making her owner bank ever since—plus landing them in intellectual property conflicts. At its start, the Grumpy Cat meme business became so lucrative that her owner Tabatha Bundesen quit her job as a waitress at Red Lobster and founded Grumpy Cat Limited. Through the sale of t-shirts, books, pillow, and other Grumpy Cat branded items, Bundesen has reportedly raked in millions. As the Chicago Tribune points out, Grumpy Cat has appeared on The Ellen Show, Good Morning America, American Idol, and many other popular shows. Tardar Sauce—the cat’s real name—also became the face of a Honey Nut Cheerios ad and an ambassador for Nestle’s Friskies cat food. It’s unsurprising, then, that such a lucrative cultural icon would be subjected to copyright infringement as other businesses try to capitalize on the kitty. One intellectual property dispute that began in 2015 was ruled in favor of Grumpy Cat and her owners Wednesday, awarding Grumpy Cat Limited $710,001 in damages, according to the Chicago Tribune. Grumpy Cat’s case was against the Grenade beverage company. Grumpy Cat Limited previously struck a deal with Grenade to sell a “Grumpy Cat Grumppuccino” line of iced coffees. When the company tried to also make “Grumpy Cat Roasted Coffee” and some other Grumppuccino merchandise outside of their agreement, Grumpy Cat Limited filed a federal lawsuit for copyright infringement. 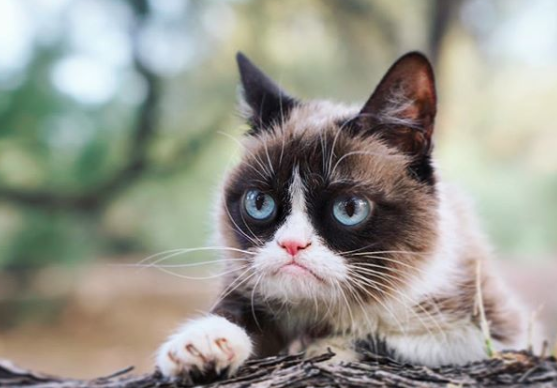 “Ironically, while the world-famous feline Grumpy Cat and her valuable brand are most often invoked in a tongue-and-cheek fashion, Defendants’ despicable misconduct here has actually given Grumpy Cat and her owners something to be grumpy about,” the complaint stated. Grenade countersued, claiming Grumpy Cat didn’t promote the coffee like it had promised, but the jury still sided with Grumpy Cat. Perhaps it’s because Tardar Sauce herself made an appearance in court—and who could say no to a face like that?